Containing two of India’s biggest rising stars and with a music score to match its powerful lead character – has a new, angry young man burst onto the scene and will it connect with a divided world? 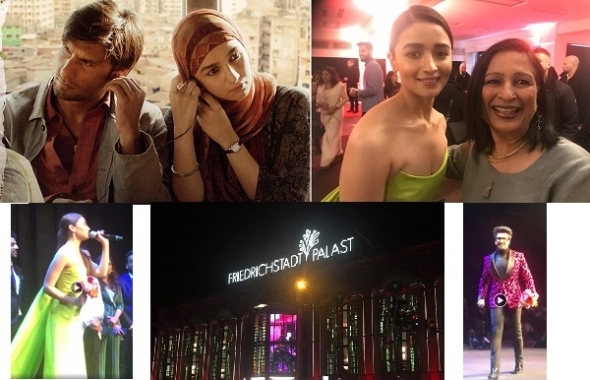 EXPECT a big opening for ‘Gully Boy’ this week as it drops into cinemas globally, following a triumphant world premiere at the Berlinale (Berlin International Film Festival). 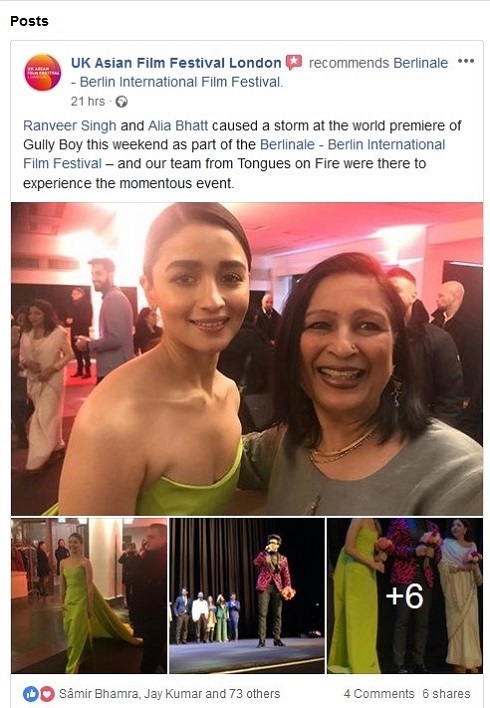 The Zoya Akhtar directed film starring Ranveer Singh (as ‘Murad’) and Alia Bhatt (as ‘Safeena’) caused quite the stir when it had a Saturday evening screening at one of the Berlinale’s leading venues. Cameron Bailey, the director of the Toronto International Film Festival (TIFF) said he had never witnessed such a reception for a film at the Berlinale in 20 years. The western trade papers gave the film positive reviews and suggested it had real crossover appeal and Indian critics too have given it the thumbs up. Yesterday there was a screening in Mumbai for other members of the filmmaking community. Actor Rahul Bose was among those who heaped praise on Akhtar, Singh and Bhatt. The story centres around Murad, the rapper, and is loosely based on the experiences of Indian rappers Divine and Naezy. Gully refers to the streets and byways of a city. Murad lives in the slum area made famous in the West by ‘Slumdog Millionaire’, Dharavi, and amid an increasingly fraught home life, sharing limited space with his father, his old man’s new wife and his biological mother, finds happy diversion in both his music and his girlfriend, who happens to be from the other side of the social tracks as a medical student and daughter of a doctor. In between all this comes ‘Sky’ (Kalki Koechlin) a wealthy, privileged Mumbaikar, who notices Murad and agrees to fund a music video for him. There is the spectre of crime and a life on the wrong side of the law in ‘Moeen’ (Vijay Verma), while ‘Sher’ (Siddhant Chaturvedi) offers Murad encouragement and belief to carry his music forward. 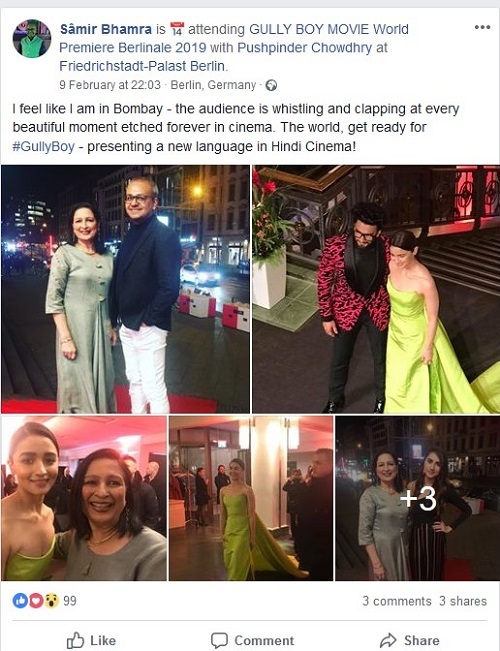 Our friends from the UK Asian Film Festival* (UKAFF and once known as Tongues on Fire) were in Berlin and attended the world premiere. Bhamra also gave acv his assessment of the film and its crossover potential. “The film is great. What is interesting is that the film is layered and told from the protagonist who belongs to one of India’s minority communities (Muslim). “This allows it to also address dysfunctional family issues such as a dad marrying for the second time and the newer younger wife lives in the same slum home as the rest of the family. “I liked how this sparks situations later in the movie. Films that feature Muslim protagonists have rarely done very well at the box office. “So, from my perspective, the cross over appeal is when audiences put aside communal tensions and come to celebrate the angst of a new generation. One of the themes for the forthcoming UKAFF (March 27-April 7) will be Revolution. ‘Padmavaat’ was one of the most controversial films of recent times, sparking riots in some regions of India – but little was referenced as to its representation of Muslims in times gone by. the original ‘Padmavaati ’ to ‘Padmavaat ’) and not historical literature.